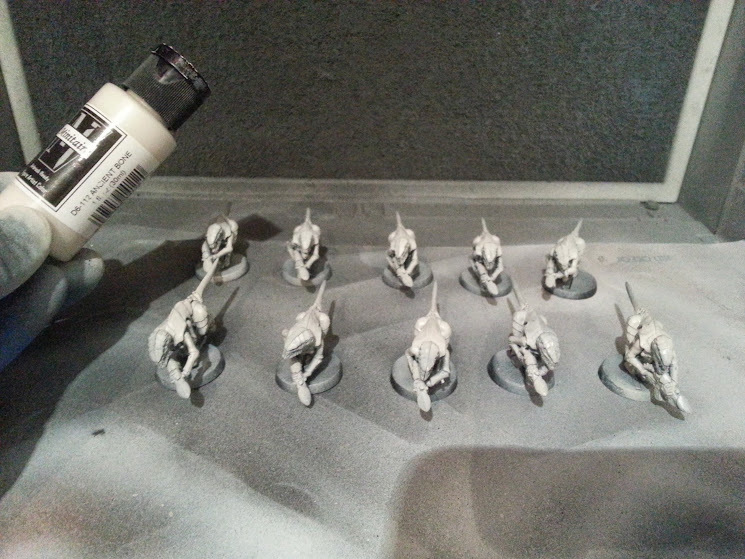 Fairly happy with how they came together, although the carapaces are a bit lighter than what I wanted. It’s OK though, they will vary in exact hue and tone but overall I’m pretty happy with the color combination. 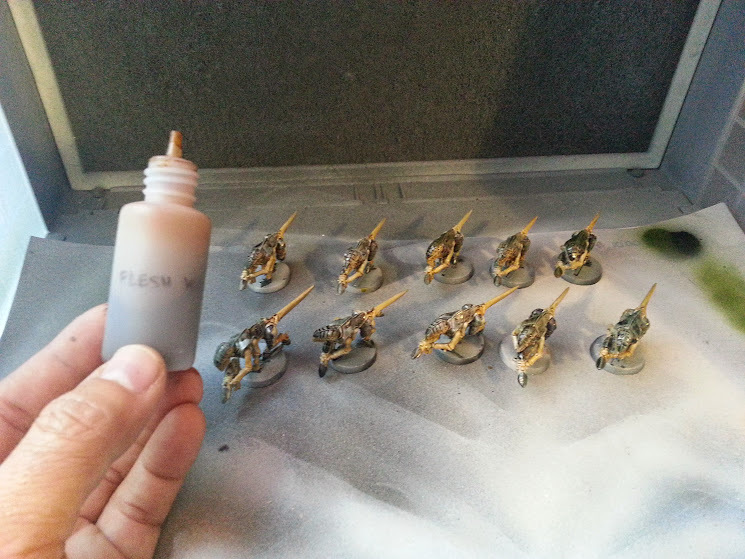 Definitely going for the Aliens color of dark green and the flesh color came out nice. 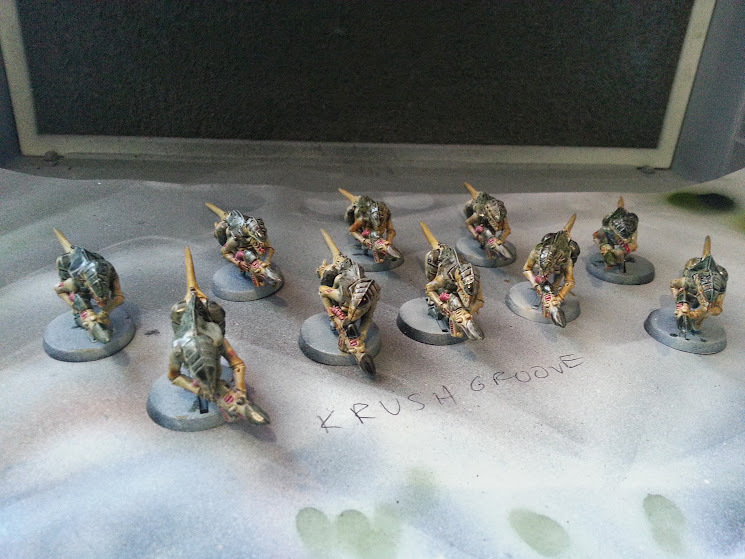 I could do highlights and more but in the end these guys will be shoveled off the table in droves so I wanted something that was quick and easy. 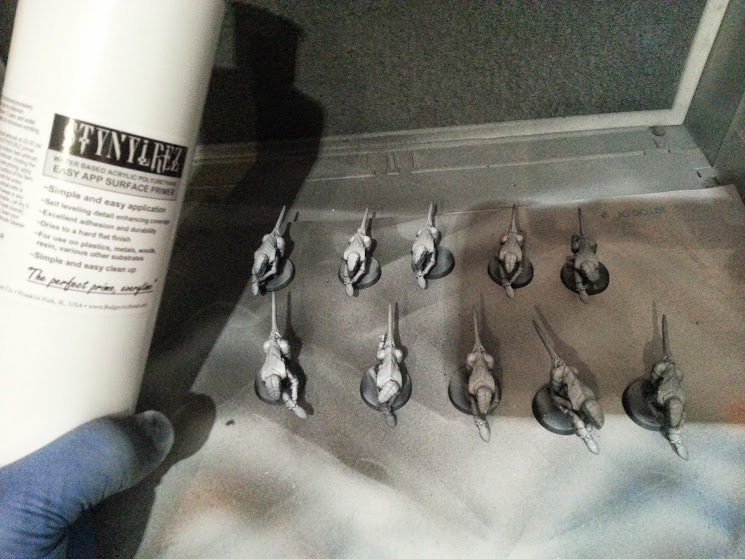 The airbrushing took no time at all, the brushwork (carapace and then the flesh wash) took about 2.5 minutes per model. I could drybrush highlights but meh. I’ll put more work into the big models though! Here’s how they came together – thank goodness for Google Drive auto-uploads from my phone camera! 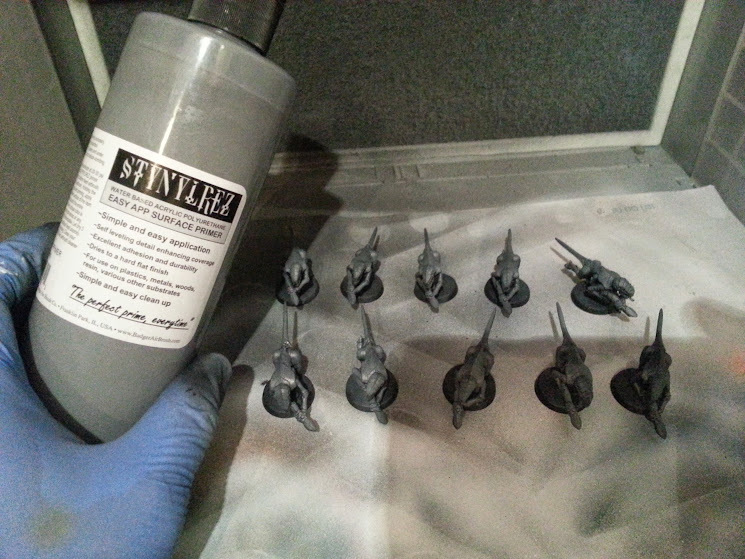 Tryed to spray Minitaire Ghost Tints on the carapace parts but I couldn’t get the air/viscosity mix right so I left it for a couple of days (until this morning) to finish off everything. 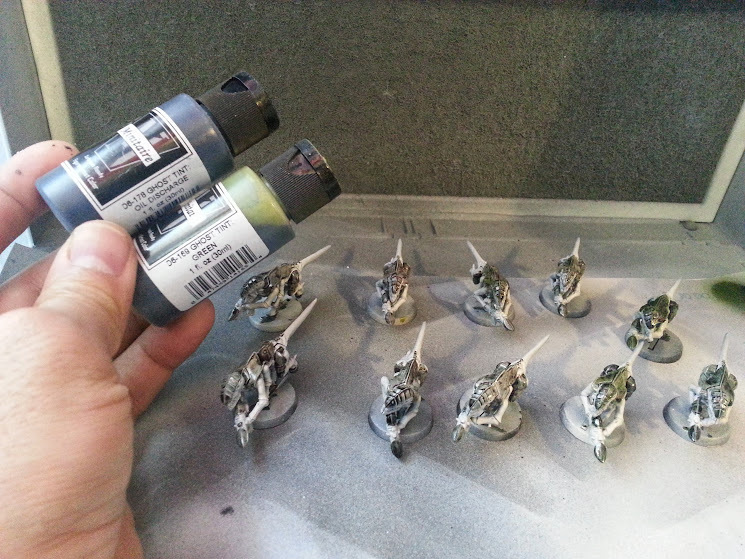 Mixed Oil Discharge and Green Ghost Tints at about a 3:2 mix and brushed them on the carapace bits. Decided to add a *little* bit of color with Ghost Tint Magenta on the ‘vent’ areas, tongues and a couple of other places. Just for a tiny bit of bright color. 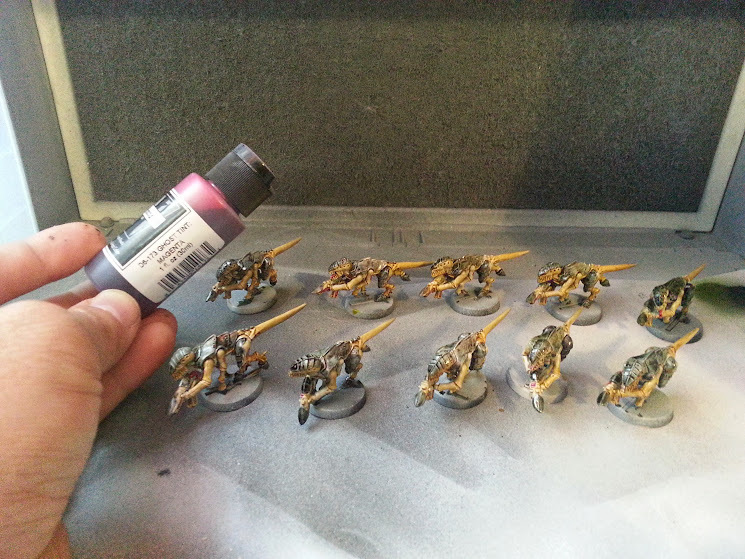 I was definitely going for the Aliens color with these guys, and I think I found my ‘recipe’ for the rest of my army, but I thought some extra color would be good. There’s more color on the other side, with the hose and eye on the gun. Finished! 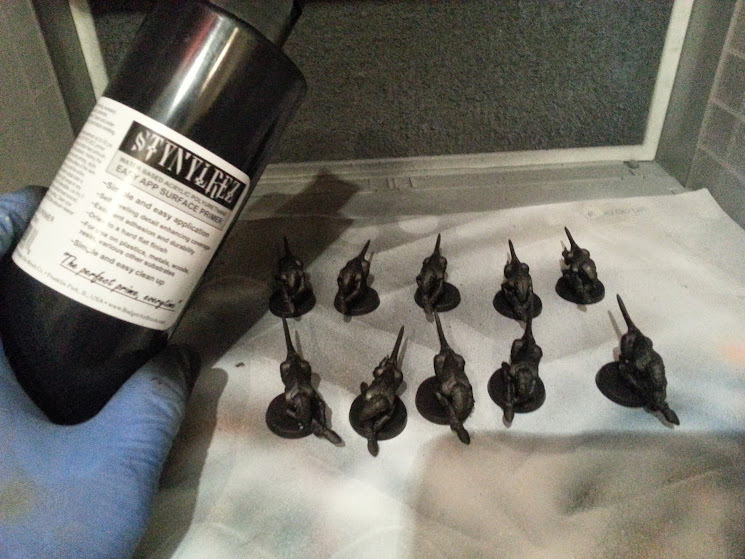 Nearly…the bases aren’t done, I’ll be rebasing all of my Tyranid models on spaceship decking style bases, which I have yet to make.